The radioactive gas radon is a hazard in many homes and workplaces. Breathing in radon is the second largest cause of lung cancer in the UK resulting in over 1000 fatal cancers per year. However, radon hazards are simple and cheap to measure and relatively easy to address if levels are high. Under UK regulations all employers must review the potential radon hazard in their premises. What will the test results mean ? Radon is a colourless, odourless, radioactive gas that occurs in rocks and soils, some building materials and water. The ground is the most important source as radon can seep out and build up in houses and indoor workplaces. The highest levels are usually found in underground spaces such as basements, caves and mines. High concentrations are also found in some buildings because warm air rising draws radon from the ground underneath buildings to enter through cracks and gaps in the floor. Radon (more properly known as radon-222) comes from uranium which occurs naturally in many different types of rocks and soils. Since granite contains relatively high levels of uranium many people think that it is only granite areas of the UK, such as the South West of England, that have high radon levels. This is untrue and, as shown on the map above, many parts of the country have high radon levels. Most radon gas breathed in is immediately exhaled and presents little radiological hazard. However, the decay products of radon (radon daughters or progeny) are solid materials and are themselves radioactive. These solid decay products, which may attach to atmospheric dust and water droplets, can then be breathed in and become lodged in the lungs and airways. Some of these decay products emit particularly hazardous radiation called alpha particles, which cause significant damage to the sensitive cells in the lung. Radon is now recognised to be the second largest cause of lung cancer in the UK after smoking. Lung cancer is also the most common cause of cancer related death in the UK with a 10-year survival rate of 5%. 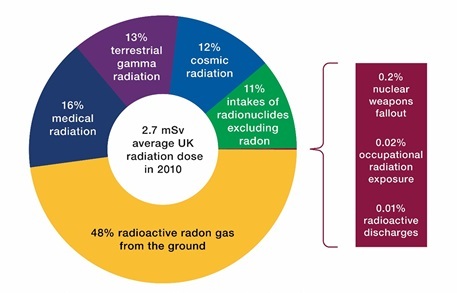 Radon contributes by far the largest component of background radiation dose received by the UK population (see chart below) and, while the largest radon doses arise in domestic dwellings (due to the longer time spent there), significant exposures occur in some workplaces. Epidemiological studies on occupational groups with known high exposure to radon show a significantly increased risk of lung cancer. A recent study which pooled the results of 13 European case-control epidemiological studies of people exposed to radon at home (Darby et al, 2005) has confirmed the risks and refined their accuracy. It also showed that the risk from radon is approximately 25 times higher for tobacco smokers than for non-smokers. Radon is measured in units of becquerels per cubic metre, Bq/m3 (the concentration of radioactivity in air). The average indoor concentration in the UK is 20 Bq/m3. Contributions to the average UK annual radiation dose (from PHE-CRCE-026 Ionising Radiation Exposure of the UK Population: 2010 Review. Public Health England (PHE) has conducted radon measurements in more than 600,000 dwellings and workplaces. 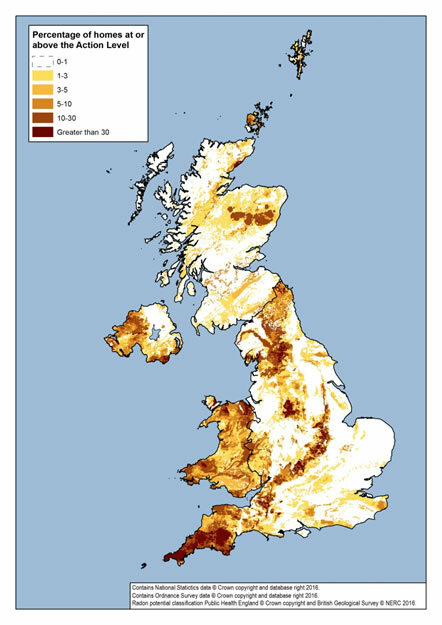 PHE and the British Geological Survey (BGS) have produced a radon potential map of the UK by combining the results of measurements in houses with maps of the underlying geology. Locations with elevated radon potential are called ‘Affected Areas’. Employers and householders may consult the definitive dataset on the UKradon website to see if their premises are in one of these areas (a small fee is charged). The ‘indicative atlas’, which shows the worst-case radon potential for each 1 km grid square is freely available on the UKradon website. All types of indoor workplace including factories, warehouses, offices, shops, schools, hotels, nursing homes, residential care homes and health centres can have high radon levels. Underground workplaces such as basements, cellars, mines, caves and utility industry service ducts can have significant levels of radon as can any above-ground workplaces, mainly in radon Affected Areas. Employers who only occupy parts of buildings from the first floor and above are less likely to have significant radon levels than those on the ground floor or below. For the vast majority of above ground workplaces the risk assessment should include radon measurements in appropriate ground floor rooms where the building is located in a radon Affected Area. Employers may choose to take a conservative approach and undertake measurements in all premises located in a 1-km grid square that is shaded in the indicative atlas (i.e. measurements are not usually required in above ground workplaces located in the white areas of the indicative atlas). If employers wish to be more specific they may choose to consult the definitive PHE radon dataset online (a small fee is charged) to identify the Affected Area status of a particular building or buildings. For occupied below-ground workplaces (for example those occupied greater than an average of an hour per week or approximately 50 hours per year), or those containing an open water source, the risk assessment should include radon measurements. This applies to all below ground workplaces in the UK (basements, cellars, mines, caves, tunnels, etc), irrespective of the above ground Affected Areas status. all workplaces located in radon Affected Areas. The Ionising Radiations Regulations 2017 (IRR17) come into effect where radon is present above the defined level of 300 Bq/m3 (as an annual average) and employers are required to take action to restrict resulting exposures. The HSE and Local Authorities are responsible for enforcing these regulations in particular types of workplace. Radon surveys should be conducted in any workplace where its location and characteristics suggest that elevated levels may be found and significant exposures to employees and/or other persons are possible. Inexpensive surveys can be carried out by leaving small plastic passive detectors in rooms or occupied locations of interest. The PHE website contains up-to-date details of validated laboratories capable of supplying such detectors for undertaking radon measurements. Delivery and return of the dosemeters is usually by post. The Building Regulations 2004 (England, includes 2010 and 2013 amendments), the Building Regulations 2010 (Wales, includes 2017 amendments), the Building (Scotland) Regulations 2004 and Building Regulations (Northern Ireland) 2000, supported by BRE report BR211 describe where new buildings and extensions (workplaces and dwellings) might need to incorporate protective measures installed during construction. These measures are described below. Since even new buildings with protective measures may have high radon levels, employers must still test as described above. Experience has shown that radon concentrations in adjacent buildings, even adjoining ones, can differ greatly (for reasons including local geology, building design and usage), so measurement results from neighbouring properties cannot be used in the risk assessment. Where the workplace measurements show annual average radon levels below 300 Bq/m3, as is the case for the majority of employers, then the only further action required is to decide when the risk assessment will be reviewed. For occupied areas with levels above 300 Bq/m3, the employer may need to immediately take steps to manage occupational exposures pending any decision they may take to reduce the radon levels by engineered means. A Radiation Protection Adviser (RPA) with radon experience should normally be consulted about how best to manage radon exposures but, if the employer plans to introduce engineering controls to immediately reduce the radon exposures, they will also need to consult a specialist radon removal (remediation) contractor. The specialist will be able to advise on the most cost-effective engineered means of reducing radon levels. It is usually appropriate to continue monitoring in these areas at least until the reduction measures have been put in place, or to refine where the highest radon levels are located by monitoring additional rooms. The seasonal adjustments applied by testing laboratories to measurements are normally good indicators of the annual average levels in buildings. It is good practice to consider methods of restricting the radon exposures immediately if the seasonally adjusted figures are significantly greater than 300 Bq/m3 and not wait for further measurements, as this would incur additional radiation doses to persons within those premises. HSE and some Local Authorities are aware of some workplaces such as factories and shops that have measured radon levels significantly in excess of the 300 Bq/m3 action level. Worst cases have shown levels over 75,000 Bq/m3 ! Radon enters a building primarily by airflow from the underlying ground. Protection measures for reducing levels inside workplaces vary depending upon the severity of the problem and the type of building construction. New buildings can be protected during construction by installing a ‘radon proof’ barrier/ membrane within the floor structure and, in areas with a greater radon potential, provision of a ventilated sub-floor void or a 'radon sump'. A radon sump is a small, bucket sized, cavity under the floor with an electric pump drawing air from it. This reduces the normal under floor pressure with respect to radon in the soil and vents the radon gas outside the building where it quickly dissipates. In existing buildings, it is not possible to provide a radon proof barrier and so alternative reduction measures are used depending upon the radon level. Such measures include improved under floor and indoor ventilation in the area, sealing large gaps in floors and walls in contact with the ground, positive ventilation of occupied areas, and installation of radon sumps and extraction pipework. Descriptions of radon solutions are described on the BRE website, in report FB41 and on the UKradon website. If it is necessary to reduce radon levels by engineered means, the employer should ensure that the radon levels in the area are re-measured immediately after installation in order to verify its effectiveness. Regular maintenance of the engineering controls, supported by occasional (e.g. annual) measurements will ensure that the system remains effective. Controlling radon in underground workplaces such as mines, caves and tunnels may need the specialist advice of a ventilation or mining engineer. The employer may need further radon measurements to determine the seasonal variations, as radon levels underground can be considerably higher in the summer months than during the winter and affected by changing water levels. where radon levels were above 300 Bq/m3 at the initial measurement and measures have been taken to reduce radon exposures (such as engineered systems or occupancy restrictions), the remeasurement periods may need to be significantly more frequent in order to verify their continuing effectiveness. In radon affected areas employees could also be receiving significant radon exposure at home. Employers are strongly encouraged to recommend home testing to their employees who live in a radon affected area. Measurement laboratories make a charge of around £50 per house. Tenants should contact their landlords to arrange testing. Watford, WD25 9XX. www.bre.co.uk/radon; e-mail enquiries@bregroup.com. BRE can provide information on radon in the workplace, dwellings with cellars and basements, major alterations and conversions and various methods of radon remediation. PHE can provide a range of information relating to occupational exposure to radon. Contact details may be found in your local telephone directories or via their website. e-mail admin@radoncouncil.org. The Radon Council has a list of organisations that provide radon remediation services. Web form: The UK Radon Association represents a range of radon professionals in the UK. All diagrams supplied courtesy of Public Health England (PHE).